PooLovesBoo: Have a Great Memorial Day Weekend! Awesome pictures. I am heading to the beach tomorrow, so these phots are getting me excited. Don't you just love Zooey? She is great. I want a stripy swinsuit now... and a warm beach. and a rubber ring..
Ahhhhhhhhhhhhh... I'm in love with these images!!!! like your taste :D love those photos!!! Love Zooey, amazing pictures. I hope you enjoy your weekend! Yes, I loved these photos the first time I saw them! She definitely has some old soul in her. Ellen is an amazing photographer and the vintage effect is cool for the shots, especially that last one. I love Zooey Deschanel. These photos of her are stunning! Amazing photos! 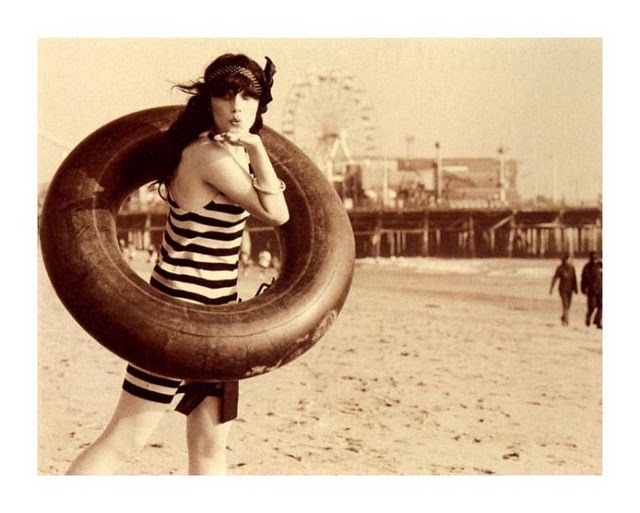 Zooey is so perfect for these vintage style pictures and swimsuits! Like the tone of the photos.